Veterans salute during the playing of Taps in honor of those lost during the Pearl Harbor attacks. 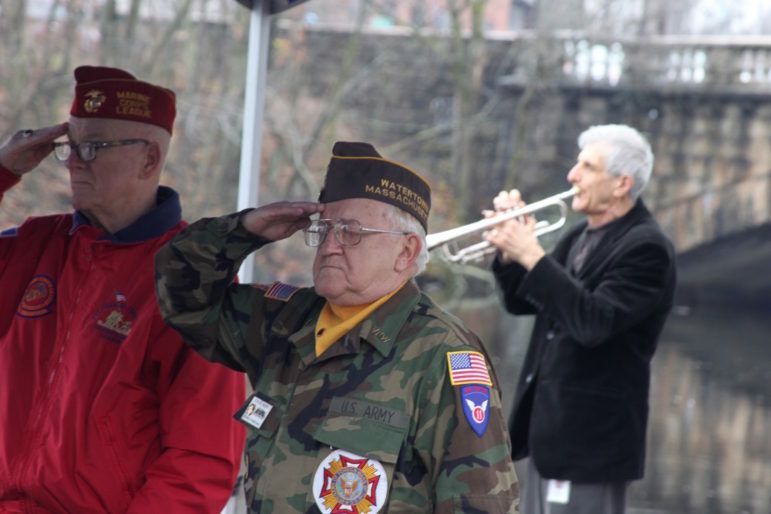 The Town of Watertown announced that the annual Pearl Harbor Day observance will be held on Friday, Dec. 7, 2018 at 12:00 p.m.
Watertown’s Department of Veterans’ Services, along with Watertown Veteran’s organizations, will hold a brief “Pearl Harbor Day 2018” observance at the landing above the former wharf in Watertown Square. Please join is as we honor our World War 2 Pearl Harbor veterans on this 77th anniversary.